Chinstrap and Adelie. Some of us hiked to the highest point to capture photos of this magnificent bay. 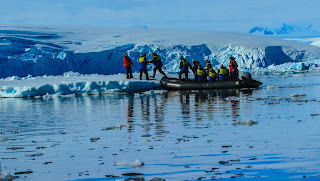 The wind picked up as we took our zodiac cruise among the ice bergs whilst others headed back to the ship. Luckily the unpredictable weather of the Antarctic changed again so that we could enjoy a deck BBQ, sipping in mulled wine. Everyone got into the mood of the evening and we even danced on deck in our arctic gear. The finale of the evening was a spectacular cruise through the Lemaire Channel.